‘If Not You, Then Who’ Part 2: Better off Without Jesus? What if I were to tell you that your greatest ability or talent is not going to be of use to you for the rest of your life? What if I told you that instead of the ability you currently have, I am going to fill you with the ability to be and to do something beyond your craziest imagination! I began playing golf at a very early age. By the time I was in high school, I played at high competitive levels – playing at the varsity level, while also playing in amateur tournaments in the off-season. I considered myself a pretty decent golfer. I would spend hours every day during the summer on the golf course. Growing up in Michigan wasn’t like Florida, where you can play sports outside year around. We had this white stuff that fell from the sky called snow that kept us from being able to do much of anything outside from the months of October to April. But when the golf courses were open, I found myself consistently there! I went on to play at Cornerstone University, a small Christian college in Michigan. I felt like I was blessed with the ability and talent to be a pretty decent golfer. In no way was I thinking then, that within 2 years, I will be married and on my way to 5 children over the course of our first 7 years of marriage. If somebody were to have told me that I would have laughed at them and told them they were certifiably insane. Well – now the joke is on me and I believe that anybody that has 5 kids over the course of 7 years automatically qualifies to be certifiably insane. I never thought I would go months – if not years – without picking up a golf club because of the craziness of my schedule between ministry and family. I remember sitting and having a serious heart to heart with my mom in regards to my relationship with Autumn. We were dating at the time and my mom knew that Autumn’s life goals were to get married and start a family. I had just ended another pretty serious relationship and had no desire to get married any time soon and DEFINITELY no desire to have kids within the first 5 years of being married. I had goals, dreams, and aspirations – I knew exactly who I wanted to be and exactly what I wanted to do. God was using me at that moment, and I knew He would continue using me no matter what I was doing – but I was comfortable right where I was. I was happy. I was satisfied with life, and I didn’t want a change! I wanted what I wanted and that is where my focus was. About 10 years later – here I am, a father of 5 beautiful children. Autumn and I have been married for nearly 9 years… Yes, 5 children in the first 7 years of our marriage – I call them the Euler Zoo on Wheels. I have picked up a golf club once in the past year, and honestly I am content and fine with that. I really do not even miss playing golf much at all. My focus has changed – my passions have changed – and my talents and abilities have changed. When we look at the phrase – ‘If not you, then who’ – we must realize that in order to be the person God desires us to be – we must step out of our comfort zone and allow God to shake us up. We must allow Him to shape us how He desires us to be. There was not this long, drawn out list of things they were required to do. They did not need to have an extended educational background. They did not need to be on top of the totem pole when it came to spiritual or political leadership. They did not need to be of a royal family that was loaded with money! They simply needed to answer Jesus’ calling and follow Him. If I were in the disciples shoes – or I guess sandals at that time – this comment from Jesus would have frustrated the heck out of me! They not only looked at Jesus as their spiritual leader and the Messiah, but also one of their best friends. They spent every waking moment together for 3 straight years! They laughed together, cried together, walked miles down dusty roads in each other’s company, ate together, had typical friendship disputes amongst each other. They looked at Jesus as a best friend. And here He was telling His disciples that not only was He going to go away for good, but that they will be better off without Him here! Jesus had a purpose in this that went so far beyond the human comprehension of the disciples. See it is easy for us to look at the end of the story and miss the shaking up of the disciples. We forget that they were human – they had passions – they had goals – they had talents and abilities. A few of them were known as successful fishermen. They were tax collectors, uneducated men with their own personal goals and dreams. Jesus picked them up, flipped them upside down, and shook much of their craziness out. He saw them as individuals who could radically reshape the course of history! And that is where we pick up the rest of the story in the early part of Acts. In Acts 2, we see the dramatic arrival of the Holy Spirit. God was fulfilling what Jesus had said in John 16. Acts 2:1-4 – “When the day of Pentecost came, they were all together in one place. 2 Suddenly a sound like the blowing of a violent wind came from heaven and filled the whole house where they were sitting. 3 They saw what seemed to be tongues of fire that separated and came to rest on each of them. 4 All of them were filled with the Holy Spirit and in other tongues as the Spirit enabled them. The Holy Spirit shows up and instantly begins shaking up the disciples – literally and figuratively. They instantly realize the need to spread the truth of who Jesus was. Later in chapter 2 we see the first ever evangelistic sermon. Peter shakes up the minds and thoughts of his audience with the truth of Jesus’ death and resurrection. Their powerful messages and miraculous acts quickly catch the eyes of the spiritual leaders, they get arrested, and are placed in the custody of the rulers, elders, and scribes and questioned as to what ‘power or what name’ they did this through. This to me is one of the greatest examples of boldness we see in the entire Bible! It is truly the first spiritual revolution in the history of the world! They saw over 10,000 people – children, women, and men come to know Christ as their personal Savior over the course of 3 days! Through the power of the Holy Spirit, Peter and John shook the world upside down for the cause of Christ! They didn’t back down and they saw their God-given purpose. The disciples’ goals, passions, and abilities changed over night! They saw the significance in reaching people for the cause of Christ! They looked fear in the eyes and completely stepped out of their comfort zone! Their ministry was built around unity and prayer! Several times throughout the first four chapters of Acts we see the group of 120 original followers of Christ develop unity and spend hours in prayer! They did not miss the message of Jesus’ death and resurrection – it was what they lived for every step of every day! What if our greatest ability or talent was sharing who Christ was with the world around us? With our friends, family members, neighbors, teammates, and the people we see at the grocery store? What if we saw the urgency to speak God’s truth into the lives of people we come in contact with on a daily basis? What if we caught the same vision the disciples caught? What if we completely relied on the power of the Holy Spirit to get us through every day? What if we were bold? Compassionate, yet truthful? What if God’s Word consumed our every spare minute, instead of television, video games, relationships, sports, and social media? What if we truly saw and experienced the power of prayer – not just prayer before a meal, but true, sincere, constant communication with our Heavenly Father? What if each and every one of us caught the vision God has for us – ‘Go and make disciples of all nations.’ There is no Plan B! We are called to be His hands, His feet, His voice, and to share His love with everybody we come in contact with! 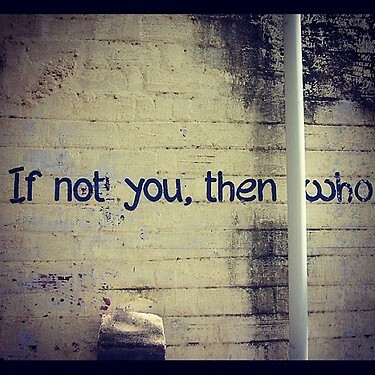 ← If Not You, Then Who?